Spacecraft and automotive fuel tanks and certain microfluidic devices require accurate modeling of liquid and gas phases for safe and efficient operations. In addition to the presence of a fluid interface in such systems, the physics of heat transfer and phase change also need to be accurately captured. How is that for complexity! In order to simulate such complex scenarios, a two-temperature, two-fluid model has been introduced in FLOW-3D v12.0. FLOW-3D’s interface tracking method, TruVOF, works in conjunction with the two-fluid model, including heat transfer and phase change. 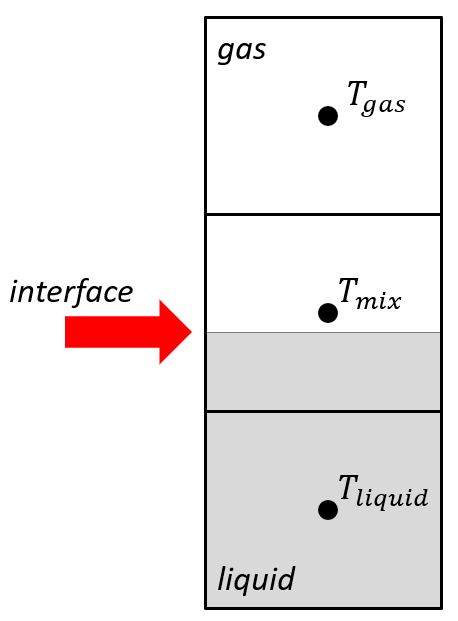 One of the simplifications of this model, however, has been that the temperature of the mesh cell that has the interface is represented by a mixture temperature (hence, a simplified model) Tmix, as shown in the following schematic. While the mixture approximation is adequate when the temperature is continuous and smooth across the interface, the same cannot be assumed for cases with liquid and gas because of the large differences in their thermo-physical properties. The accuracy of the solution in such systems could be overpowered by the excessive numerical diffusion stemming from the averaging of the fluid energy and temperature in cells containing the liquid-gas mixture. The simplified temperature slip model offers only a partial solution in such cases. To overcome the deficiencies of the one-temperature approach a two-temperature model for the two-fluid solution has been introduced in version 11.3. This involves solving the energy transport equation for each fluid and storing the temperature of each phase as well, as shown in the schematic below. 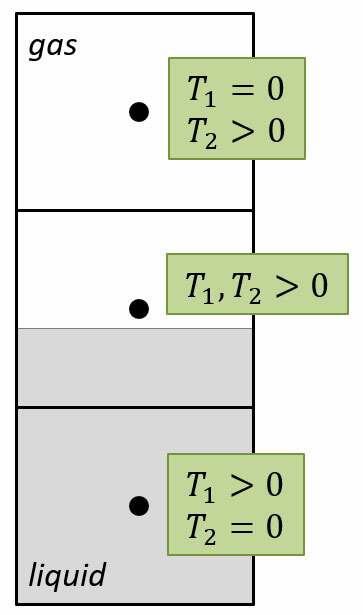 The mesh cell with the free-surface now has a representation of both liquid (T1) and gas (T2) temperatures. In this case study of tank sloshing, the liquid is at the initial temperature of 300K and gas is at 400K. The difference in the extent of numerical diffusion between the simplified and comprehensive model is shown in the animations below. From the temperature contours, as time progresses, the numerical diffusion in the solution is seen with the one-temperature approach and completely overshadows the interfacial physics. In this drop welding case study – liquid metal drops at 2300K under gravity, through the air onto a solidified metal bed. The air and bed initial temperatures are 293K. With the simplified model, the liquid metal drop temperature starts decreasing rapidly even before reaching the bed, due to the numerical diffusion. On the other hand, in the comprehensive model, the drops retain their initial temperature leading to a much better solution. Combining FLOW-3D’s two-fluid, two-temperature model with fluid interface tracking gives our users a way to accurately model complex heat transfer and phase change problems, particularly in the case of fuel sloshing systems. Please contact adwaith@flow3d.com for suggestions or comments about this new model.